If you are caring for someone living with Alzheimer’s or dementia, you may notice changes in their behaviors beginning in the late afternoon or early evening. For individuals with dementia, confusion, restlessness, insecurity, agitation and even anger worsens as evening approaches and doctors believe that the fading daylight is the trigger. For some, behaviors get even more severe and can include hallucinations, paranoia, violence and wandering. This syndrome is known as “sundowning,” “late-day confusion” or “sundown syndrome.” The symptoms usually get worse as the night progresses and get better when the sun comes up in the morning. Winter, with its shorter days of less light, also seems to exacerbate sundowning. Most of the management of sundowners involves attempting to reduce the person’s exposure to the triggers identified above. There isn’t a specific medication for this condition, although there may be some medications that can help manage some of the symptoms. There also isn’t a “one treatment fits all” plan. However, there are some approaches that seem to help many individuals and we have listed many of them here. In many cases, what works best is a combination of several of these. Set a routine and try to follow it — Having a routine helps your loved one feel safe and the day feel predictable. Plan vigorous activities for morning and limit major activities to no more than two per day. Discourage napping — If your loved one has difficulty sleeping at night, keeping them awake during the day can help. Never argue, disagree, or try to correct them — Though it can be difficult, as a caregiver or family member, you are better off to do your best to enter into your loved one’s reality. Ask them questions to find out all you can about what they are experiencing during that moment. Keep tabs on diet — Certain foods, particularly caffeine and sugar can worsen symptoms. Try to avoid these foods late in the day and stick to healthy, nutritious foods. Curb the noise — Too much noise can increase anxiety and agitation related to sundowning. Keep the noise level — both from electronics and voices — to a minimum. Let in the light — Natural light is best for someone dealing with sundowning. Keep rooms well-lit and use full spectrum lights as evening approaches and in the winter when days are short. Try supplements — Herbs such as ginkgo biloba, St. John’s Wort and vitamin E have been found to help with sundowning. Melatonin is a hormone supplement that may help your loved one to sleep at night. Check with your loved one’s health care provider before adding any supplements to his or her routine. Find humor where you can — Sometimes the things they say and do are truly funny. Laugh with your loved one as much as you can (of course be careful not to laugh at them, but at the situation). Most importantly, remember that your loved one can’t help these behaviors and it isn’t their goal to add to your stress or frustration. Take care of yourself so you have the patience that you need to deal with these behaviors. You also cannot entirely prevent behaviors that come with dementia. Consider the list of problems that sundowning causes for your loved one and find solutions to problem solve each one as much as possible. You are your loved ones best advocate! 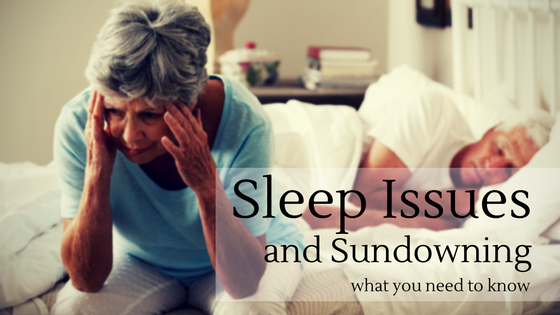 For more on sleep issues and sundowning, click here.